So the outdoor thermometer hanging over my desk became very, very faint, which suggested it was time for a new alkaline cell. The last time that happened, the insides were pretty bad, so I expected the worst, but, surprisingly, neither the cell nor the negative contact spring were corroded. So I popped in a new cell, buttoned it up, and … it didn’t work. At all. As in: blank display. Evidently, the negative terminal wire had corroded completely through and popped off when I replaced the cell. There’s plenty of green-blue corrosion on the terminal inside the case, where it can’t be seen from outside; three years ago I cleaned up both the outside and inside, so this is new news. 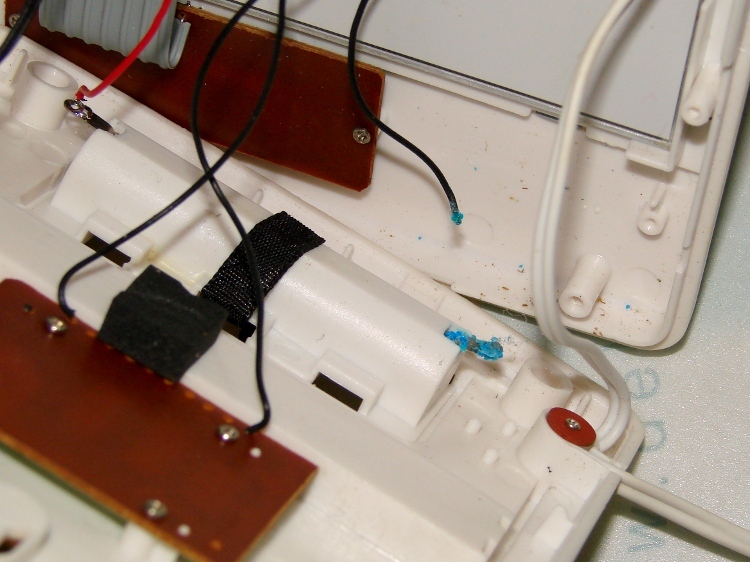 The negative wire was discolored all the way from end to end and couldn’t be soldered. I think the corrosion products are just slightly hygroscopic and wick their way along the copper strands inside the insulation: the solder pad on the circuit board was also discolored. I removed the terminal, neutralized the alkaline corrosion, ran it through an Evapo-Rust bath, scrubbed it clean, installed it, replaced both the positive and negative wires, resoldered everything, and it works perfectly again. This can’t go on, can it?